Good things come to those who wait; here is the slightly belated September Foodie Diary. It’s a briefer version than usual, but we’ll be back up to our normal lengthy tome next month. Please email your October food news to reach us by 20 September. 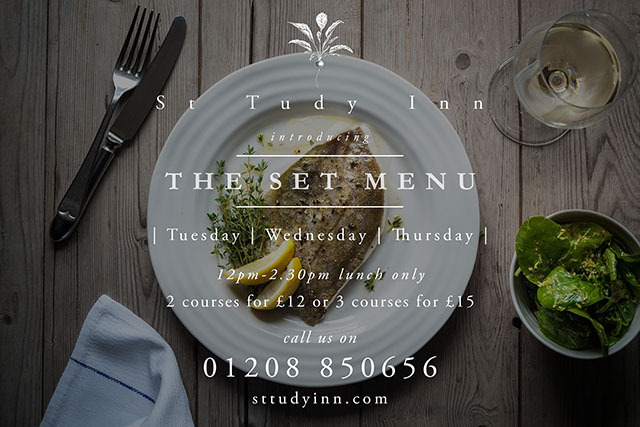 New for September, Emily Scott has launched a set lunch menu on Tuesdays, Wednesdays and Thursdays at her popular pub, St Tudy Inn. Details are in the image above (two courses for £12, three courses for £15); for reservations please phone 01208 850656 or book online. The popular Newquay Fish Festival will be held from 11-13 September. Three days of food, drink and entertainment are sure to attract a good crowd. The Little Orchard Cider and Music Festival takes place the same weekend (11-13 September) at Healey’s Cyder Farm at Penhallow near Newquay. Expect a lot of cider, music, street food and family entertainment. Camping available. You will be able to catch St Tudy’s Emily Scott demo-ing at the Bude for Food Festival over the weekend of 18 to 20 September. Keep an eye on their website for the demo timetable, which was not available at the time of writing this. The line up of chefs, food producers and entertainment promises for a great weekend. Also this month, The Great Cornish Food Festival takes place on Lemon Quay in Truro from 25-27 September. There are demos all day, every day, from top Cornish chefs including Nathan Outlaw, Andy Appleton, Jack Stein and Mark Devonshire. The huge marquee will contain around 50 food stalls. Last but not least, an epic 18 day Festival of Food in Cornwall will be held at The Eden Project from 10 to 27 September. Guest chefs include Ken Hom and Jean-Christophe Novelli; see their website for full details. Their family weekend on 19 and 20 September features special guest appearances from Henri Le Worm and friends on Saturday, and CBeebies’ Katy Ashworth on the Sunday. Fifteen Cornwall’s Cornish Harvest lunches (three courses for £24) run from Monday to Friday from 28 September to 16 October. The menu celebrates the beautiful bounty of Cornish produce that is harvested at this time of year, and changes daily depending on what is delivered to the kitchen door by the restaurant’s suppliers. 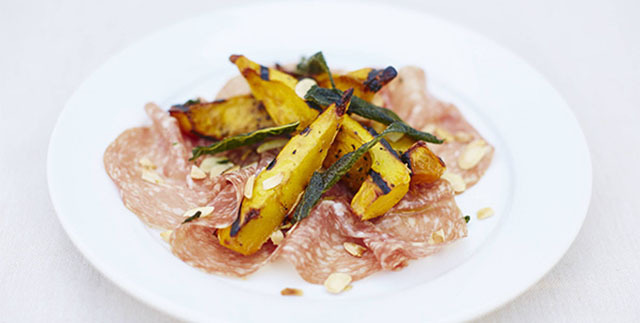 Favourite dishes for this time of year include: Toscano salami, squash, pumpkin seeds and crispy sage to start (pictured); main courses of wood-fired Cornish chicken with a hearty Italian chickpea stew and ‘nduja dressing, or a crispy fillet of salted hake with lentils, purple sprouting broccoli, rosemary and anchovy. For pudding, popular autumnal choices include vanilla panna cotta with plums and shortbread or Fifteen Cornwall’s signature rhubarb and cinnamon cake with toffee sauce. See the sample menu and for reservations phone 01637 861000 or book online. Japanese lobster claw roll with rice paper, shredded vegetables, coriander, mint and ponzu dipping sauce. Lobster tail maccheroni pasta with basil butter and fried chili crumb. Grilled half lobster tail served in the shell with Asian pesto, rocket and fries. The Beach Hut raspberry Eton mess with vanilla bean marscapone and brown sugar meringues. And all that will be washed down with late summer cocktails, white wine and Champagne – the wine flight, along with a dessert wine, is available at an extra £15 per person. Plus there’ll be a bonfire on the beach, music by the bar and dancing on the deck. £50 per person, book online. Truro’s Craftworks Street Kitchen on Lemon Quay is going great guns, with a fantastic menu of burgers, tacos, burritos and salads to eat in or takeaway. Definitely one to try next time you are in the city. Keep an eye on their Facebook page for special dishes and events. Plus they offer a party catering service – get in touch for more info. Ben Cox (sous chef at Oliver’s in Falmouth) is putting on an exciting pop-up event at Mono in Falmouth: What @ Mono at 7.30pm on Sunday 6 September. The Cuban themed evening will have “a relaxed, vintage club feel with the emphasis on good food and great music”. Kabasa, a Cuban band based in Penzance, will provide the evening’s music while Ben creates a tasty feast in the kitchen. For tickets phone 07999 927165 or email [email protected]. New head chef Ray Kemp is producing some beautiful looking food at Pentillie Castle. They are offering a new Autumn Dinner B&B package, available the week commencing 7 September and other selected dates in September and October. Prices start at £90 per person per night. 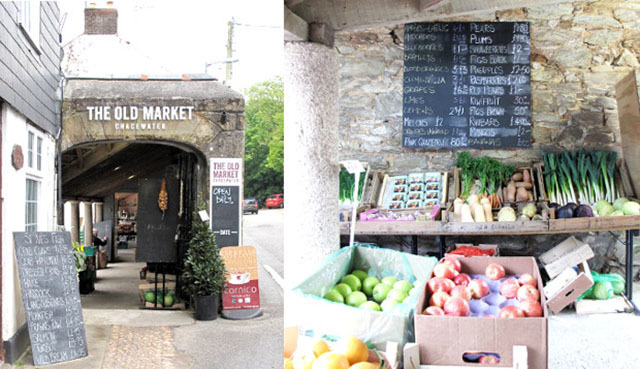 Launched in December 2014, The Old Market, Chacewater has quickly become a foodie haven. Owner Tony Murley had a clear vision when he took over the run down area behind the village pub to create an affordable place to shop for exceptional products and quality food. Sell-out Feast Nights have also been taking place over the summer, drawing in locals and tourists alike, enjoying pulled pork, roasted hake parcels and lamb shanks, cooked by Tony. September Feast Nights are taking place on 5 September and 27 September with chicken and chorizo paella and mixed seasonal vegetables on the menu. 50 tickets are available, priced at £10 and must be purchased in advance from the market. More dates will be available in October, November and December, with booking shortly to be available via the new website. Award winning artisan sourdough bakery Little Bakehouse at Launceston has launched a new sourdough bread baking course. Students will use heritage flours such as organic rye and spelt in small groups at their in-store bakery in Launceston. Each course will run over a weekend and aims to help “Real Bread” enthusiasts learn the skills and have the confidence to produce fantastic tasting bread at home. The first course will be held on 12 and 13 September at their Launceston bakery and costs £90 per person. Get in touch via their Facebook page. Further dates will be available. The Buttermilk Confectionery Co. are currently running a fudge-themed baking competition. Full details are on their Facebook page, and the competition ends on 30 September. On 11 September The Gurnard’s Head is holding The Cabrito Goat supper, hosted by James Whetlor of the Cabrito Goat Company. The five course dinner with carefully matched wines costs £55 per person and the menu looks fantastic. On 18 September The Gurnard’s Head will be hosting its second Forage and Feast day. Hosted by Caroline Davey of Fat Hen it will be a circular coastal walk from the Gurnard’s Head looking at wild edible plants and then heading back to the Gurnard’s Head for a three course lunch. £50 per person. Enjoy the EATDRINKSLEEP September Sleepover between 1 September and 1 October. Dinner, bed and breakfast at The Gurnard’s Head from £290 per couple and at The Old Coastguard from £329 per couple. After a summer of fun the pop-up cafés at Carlyon Beach, including Sam’s at the Bay, close on Sunday 7 September for the winter. Roll on spring 2016 when there’ll be more fantastic events taking place on the sand. Delicious-sounding events at the Padstow Seafood School this month include a six course Vina Morande Wine Dinner on 8th (£85 per person) and a meat masterclass with Warren’s Butchers and Mark Puckey on 17th (£16 per person). The school is also offering a 20% discount on their two day Taste of the Mediterranean course on 15 September (£288 per person,was £360). Keep an eye out for a new Clandestine Cake Club event in Cornwall. If you like cake, then this could be for you. Register now (it’s free) and join the Cornwall club to be the first to know about the secret event. September’s courses at Philleigh Way Cookery School include foraging with Thom Hunt on 8th, a Beginner’s Bread course on 19th, a Filled Pasta course on Tuesday 22nd and a Hot Smoking at Home course on Wednesday 30th. Highly recommended. Congratulations to Restaurant Nathan Outlaw on making it to number four in The Good Food Guide’s Top 50 Restaurants of 2016, and to Paul Ainsworth at No 6 in Padstow who is placed 27th. Hooray – Wildbake are back on their normal rounds now the summer holidays are over! You’ll find them serving their delicous wood-fireds pizzas in Wadebridge on Mondays, Bodmin on Tuesdays, St Columb on Wednesdays and at Padstow Touring Park on Fridays. More congratulations to Camel Valley Vineyard, who received “Best in class” and a gold medal for their 2012 Camel Valley Pinot Noir Rosé at the World Champagne and Sparkling Wine Championships. Polgoon Wine Flight Night takes place on Friday 11 September at Senara Restaurant in Penzance. River Cottage’s Tim Maddams will be cooking; Polgoon are supplying the wines. £45 per person, phone 01736 333946 to book your place. Despite a soggy August Aval Dor Vodka have had a bumper crop of potatoes this year. Their vodka is proving popular and we will be selflessly sampling some soon. Will report back! Good luck to all those who have been shortlisted in the Great Cornish Food Awards. Results will be announced at The Great Cornish Food Festival at the end of the month. The Wild Wine Club’s next event is a lunar spectacular on 3 October, involving biodynamic wines, a five course feast, camping and breakfast. Full details on their Facebook page – it looks fantastic. £65 per person. Trelowarren’s New Yard Kitchen is available for private functions. Good luck to The North Coast Wine Co. which opens in Bude on 12 September. Congratulations to Design Room Cornwall on the completion of a new Cornish food book, to be launched at The Great Cornish Food Festival. We’ve heard great things about Hayle’s Duckies Café, located in the Old Foundry Chapel. The homemade cakes look particularly delicious, as do their fresh soup and sandwiches. Bridge Bistro in Wadebridge is holding a “Margot’s Reunion” on Monday 14 September, with a special six course tasting menu by Phil, Dave and Adrian. The Social Dining Network‘s September event is a Jamaican themed evening at Cribbs Caribbean Café and Bar in Falmouth on Tuesday 15 September. £14.50 per person, book online. Catch The Fish House chef Paul Harwood cooking lemon sole with a vegetable broth at this year’s Newquay Fish Festival at 2pm on Saturday 12 September. 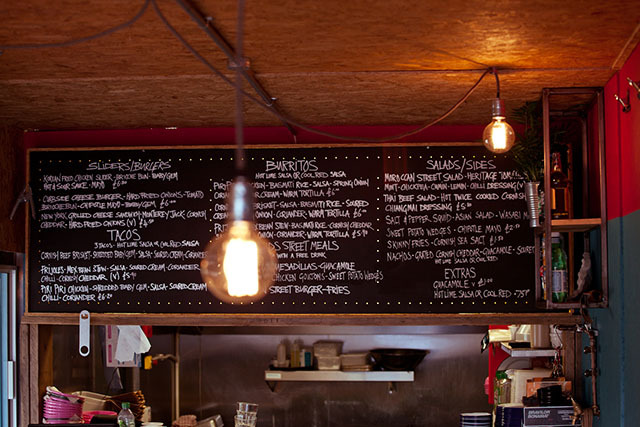 More pop-ups at POP include Thyme and Tide’s Seafood BBQ Feast on 4 September. See Facebook for more events this month. Ponsanooth’s Dynamite Valley Brewing Co. make small batch beer. Their Beer Café at the brewery is open every Saturday from 12 to 6pm. We’ve been told that No 5 Coffee House in Newquay is worth a visit. It’s part of the Sunnyside Hotel business and does great breakfast, brunch and lunch. It’s in a beautiful room and has a sofa area with kids toys. The Globe in Fowey is soon to launch a seven course tasting menu. Watch this space! The Thirstea Co. have let us know that they are now closing on Fridays until the end of October. Every other day they’ll be serving hot soups with fresh bread rolls, along with pasties, homemade sandwiches, and loads of home baked cakes and bakes. Lusty Glaze’s Secret Supper Club will be held on 24 September and their Sundowner Sessions continue every Friday evening. Free entry. Congratulations to Rasher and Inkie’s who won the South West heats of the British Street Food Awards in Falmouth at the end of August. Good luck in the final! Nancarrow Farm’s next feast night will be held on 16 and 27 September. Sadly they’re all sold out, so keep an eye out for more events on their Facebook page. Check out the Polurrian Bay Hotel’s website for autumn deals, including their ‘Midweek Autumn Special’, priced from £299 per room for two nights, including breakfast and a two course dinner for two adults on each evening. 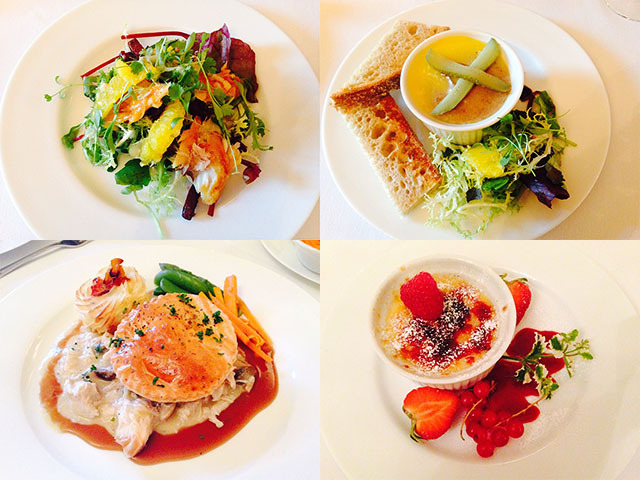 We love Tom Hunter’s cooking at The Scarlet. Their set lunches are fantastic value, definitely worth a try. Three courses for £22.50, available Monday to Saturday. Knightor Winery are holding their first feast night on 18 September, with a seven course tasting menu for £30 per person with matching wine flight £15 each. We love to hear from you! Whether you want to add something to the items listed above, or have news for us, please comment below or send us an email. NB if you have something for The October Foodie Diary please send it by 20 September.